A fascinating city for its industrious, friendly people and great food. 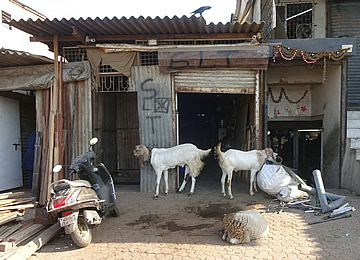 We stayed at a very small place in a fantastic location just minutes from the Gateway of India, but the street entrance to the Abode is shabby and very off-putting - I was quite concerned when our taxi from the airport pulled up here. The Abode itself is decorated in a very individual style, an antidote to chain hotels, but perhaps their definition of luxury isn't quite the same as ours! The bathroom of our "luxury" room was cramped with bare cement walls and a tiny shower. But the room itself was large (though somewhere other than hooks to hang clothes would have been nice!) and bright, with a wide view over the busy street which is fascinating to watch at any time - even at five in the morning when two women and a man squatted on the pavement and sorted rubbish for recycling! We took several of the hotel tours and they were all excellent, either with a guide and driver or the guide driving too, or walking and tuk tuk - an experience in itself in the mad traffic of Mumbai! 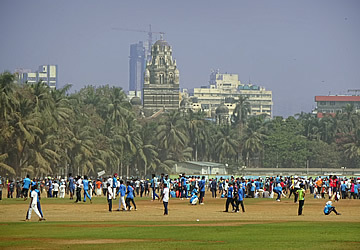 Cricket on a Sunday afternoon at the Oval Maidan. 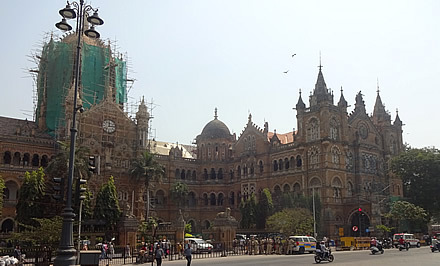 The ornate tower is Churchgate Station. On our first afternoon, though, we did a little exploring on our own. It was a Sunday and we were fairly sure there would be cricket matches on somewhere - we'd already spotted some on the drive from the airport. 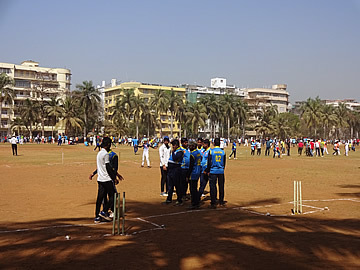 We thought the Oval Maidan would be a good bet and we were right - beyond our wildest imaginings! The park is huge and every square metre was occupied with cricket games and at least two tournaments. 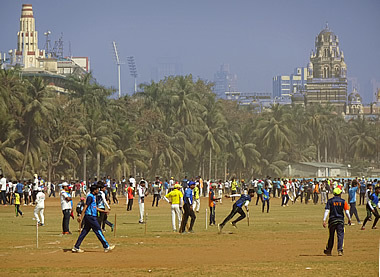 Video: Sunday cricket at the Oval Maidan. 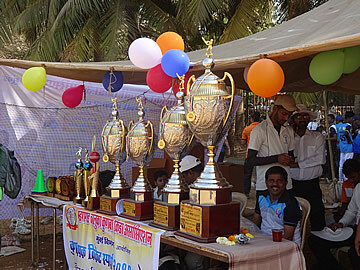 Trophies for one of the cricket tournaments. There were countless wickets set up side by side. It was impossible to actually seriously watch any of the matches apart from those at either end, conducted in full cricket whites and playing in a space separate from the hundreds of cricketers in the rest of the field. The red and white tower is the Art Deco Eros Theatre. The city is built on seven islands and has been inhabited for millennia, originally by fisherman then various dynasties, Hindu and Muslim, before the Portuguese took over in the 14th century, naming it Bom Bahai - Good Bay, which the British, who the Portuguese handed over to in 1665, pronounced Bombay (everyone still seems to call it Bombay!). 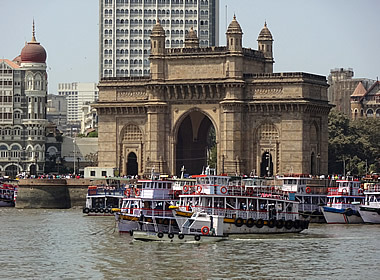 The British government leased the islands to the East India Company and the city flourished as a trading port. Great earth works joined the seven islands and grand colonial buildings sprang up. 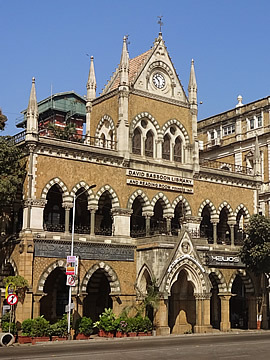 These are still prominent in the city today - the Gateway of India, Victoria railway terminus, Mumbai University and the High Court probably the best known. 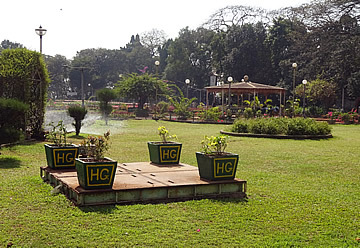 The street on the west side of the Oval Maidan is lined with Art Deco buildings. Victorian Gothic is typified by pointed arches above windows and doors, turrets, and steeply gabled roofs. 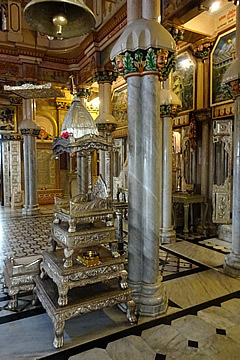 In India it is combined with Indian architectural elements, such as Mughal domes, in a style known as Indo-Saracenic. Municipal Corporation Building, close to Victoria Terminus; late 19th century. 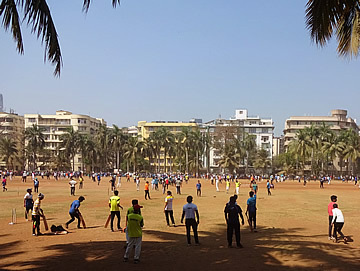 The Oval Maidan; the Victorian Gothic Rajabai Clock Tower on the right, designed by Gilbert Scott and modelled on Big Ben, is part of Mumbai University. 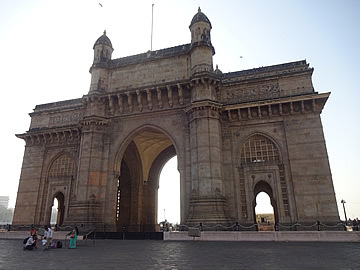 The best known of the Victorian monuments has to be the Gateway of India, built to commemorate the visit of King George V and Queen Mary to India in 1911. They landed in Mumbai and the visit culminated in the "Delhi Durbar" in December. The style is again Indo-Saracenic with Islamic/Gothic style arches and dome-topped turrets. The area around the arch is very popular with tourists and locals. Ferries leave from the jetty behind the Gateway and we took the first ferry of the day from here to visit Elephanta Island - one of the must-sees of Mumbai! 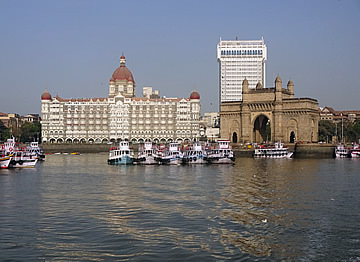 The Gateway of India from the Sea Lounge of the Taj Mahal Hotel. 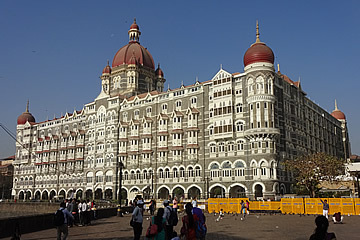 Near to the Gateway is the famous Taj Mahal Hotel. 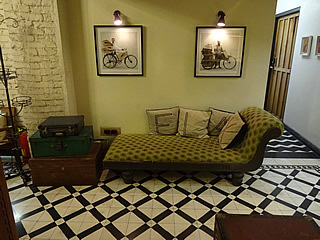 Dating from the early twentieth century the hotel design was originally begun by Indian architects but completed by W. A. Chambers. Our guide told us that Chambers did not stay around to see the completion of the building and was so horrified to discover that it had been built back to front - with the main entrance at the back and not on the side facing the sea - that he committed suicide by jumping from the building. However, there is no evidence to support this story. The hotel was commissioned by Jamsetji Tata, the scion of the multi-company Tata Group. 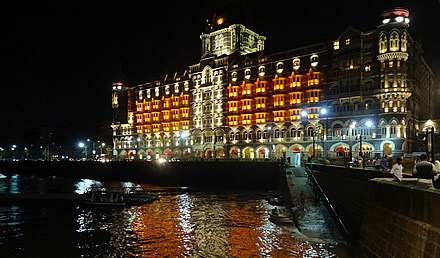 It is said that Tata built the hotel in revenge for not being allowed into the "whites only" Watson's Hotel but it is more likely that it was built to provide Bombay (as it then was) with a truly first class luxury hotel. 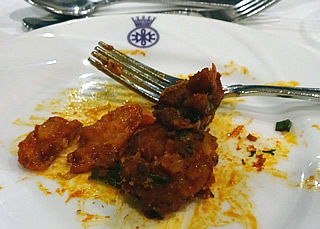 Crispy lotus stem and spicy Kerala prawns at the Willingdon Sports Club. 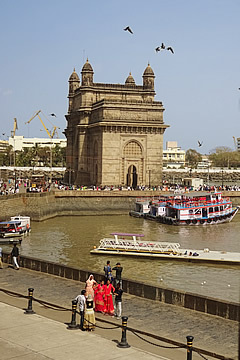 We had a couple of lunches in the hotel in the Sea Lounge with its fine view of the Gateway of India. The Mumbai Mix Toastie was very good "classic Mumbai street sandwich of potatoes, bell peppers, onion, cheese and green chutney", as was the Kheema Ghotala Toastie "A tasty scramble of rustic spicy lamb mince, coriander and eggs", and drinks in the Harbour Bar, which is surprisingly small. We were taken to the Willingdon Sports Club by friends for dinner - a very exclusive club only open to members. 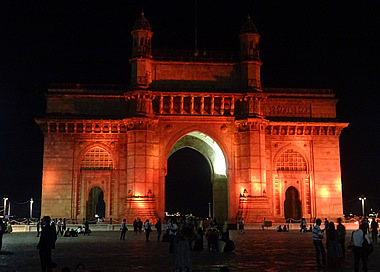 Over a hundred years old it was founded by the Governor of Bombay, Lord Willingdon. Our friends gave us a short tour, all very much still in the colonial style - a huge card room full of card tables which is still extensively used, and impressive rest rooms - facilities include an 18 hole golf course, tennis, badminton and squash courts, swimming pool, gym, library, as well as restaurants. We had some very good food there: the crispy lotus stems were new to us and extremely good, as were the spicy Kerala prawns, a lamb gosht and a wonderful Malayan lamb rendang. We finished with sweet pancakes with a coconut filling, curly flat noodles with a honey and cointreau glaze and mango ice cream. We slept very well! Though the city has some fine buildings, it is the people and their day-to-day activities that make it extraordinarily interesting. 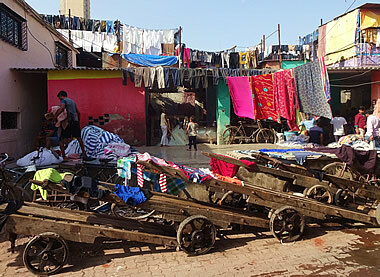 Away from the colonial and modern city we entered a Dhobi Ghat - an outdoor laundry. These people work hard. 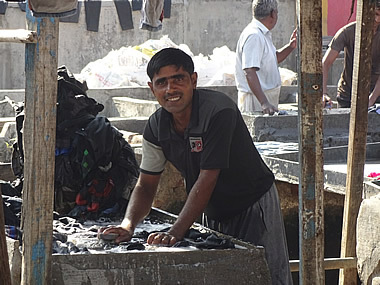 Mostly men pound and slap and stomp the clothes in the stone wash tubs but this is a commercial enterprise - at home the women generally do the washing! The people were as friendly here as in the rest of India. 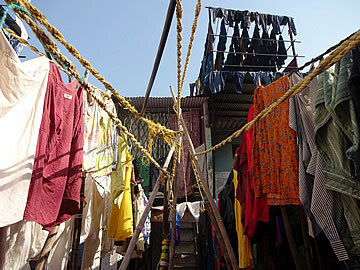 The twisted rope method of suspending the laundry we had seen in Kochi last year - a very efficient system that allows the laundry to be detached with a simple tug. 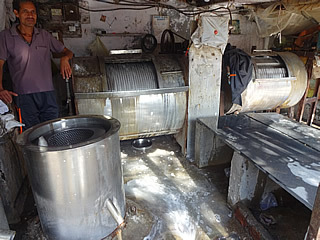 Not all of the washing is done by hand, there were quite a few of these large drum washing machines. There were also washing machines and huge machines for pressing large flat items, but shirts etc. are done by hand. We had driven along Marine Drive in our exploration (rather our driver had - Mumbai traffic is a nightmare). 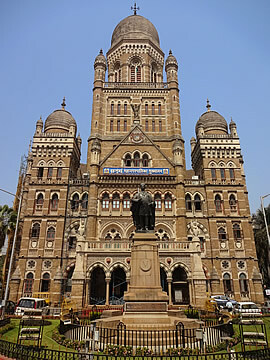 It is lined with Art Deco - Mumbai is second only to Miami in the number of Art Deco buildings. At this time of year it is also home to huge wedding venues, each decorated with masses and masses of flowers and decked with fabulous draperies, floor coverings and furnishings. 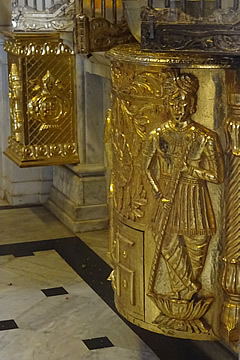 We went on to Babu Amichand Panalal Adishwarji Jain temple. Jainism holds that all life is sacred and adherents go to extraordinary lengths not to kill anything. 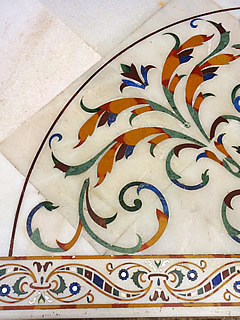 Pietra dura in the temple courtyard. 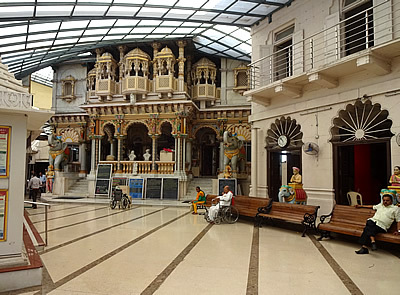 We had already seen some magnificent Jain temples in India, notably Bhandasar Jain Temple in Bikaner with its beautiful paintings and colourful sculpture, the wonderfully carved Jain Temple Complex in Jaisalmer, and the fabulous Jain Temple at Ranakpur. 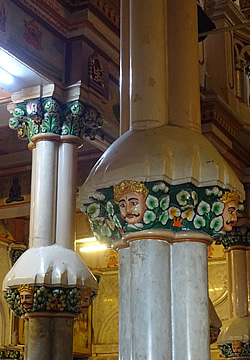 This temple in Mumbai was quite small and we were not allowed to enter as it was busy with worshippers, but it is also colourfully decorated, though it is difficult to see the painted dome ceiling without stepping inside. We were allowed to take photographs from the open doors. The Hanging Gardens were built over a vast reservoir in 1880. Apparently birds taking flesh from the nearby Parsee Tower of Silence dropped bits into the reservoir - not very healthy! so it was covered over with these extensive gardens. The reservoir beneath was extended in 1921 to hold 30 million gallons of water. It's a pleasant enough spot and probably a very welcome place to relax for locals; being higher up it will no doubt be cooler than the city. 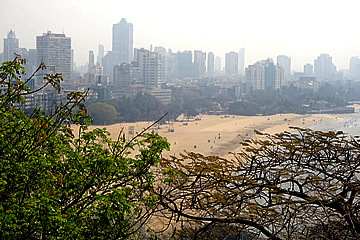 Mumbai and Chowpatty Beach from the Hanging Gardens. Our guide showed us photographs of the Tower of Silence. 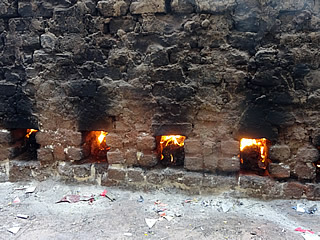 It is a low, hollow cylinder with a wide platform on the inner wall where bodies are laid out - rather a gruesome sight. 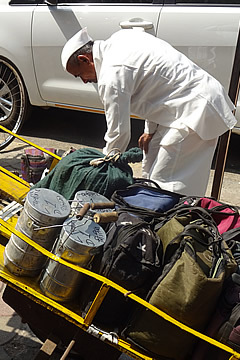 Dabbawala loading lunches onto his cart. 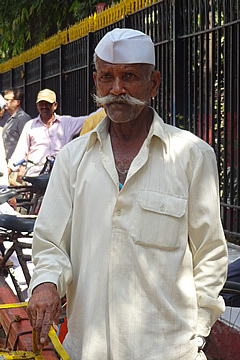 This distinguished dabbawala is famous and has appeared in films and ads. 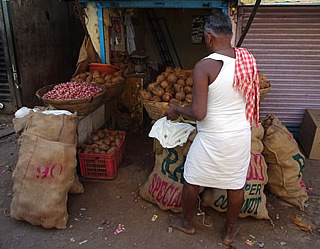 Some still use the traditional metal canister but most use their own bags and containers. Here the complex codes can be seen. 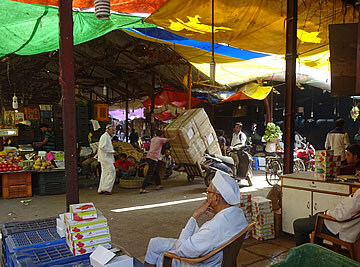 The highlight of the morning was a visit to the dabbawalas - the men who carry lunches to workers around the city. Traditionally the dabbawalas of Mumbai all come from a few villages in Maharashtra, 200km east of Mumbai.2 A dabba is the traditional cylindrical metal tin used to carry food, and wala is the person who carries it. But this is no ordinary delivery service. It begins in the home of the worker where, after the worker leaves in the morning, lunch is prepared, usually by a wife. 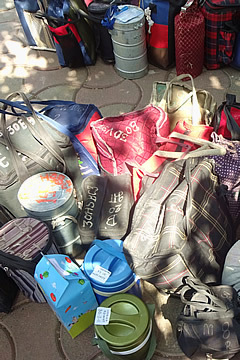 A dabbawala then collects these lunches from the homes and takes them to a train station. An ingenious colour, letter and number coding system guides the lunches on their way to the correct destination in the city, loaded onto bicycles and carts and delivered to hungry workers. Thus workers in the heart of the city can get a home-cooked lunch every day. The system is unique in India. Other cities imitate it with bicycle deliveries from restaurants but these are just ordinary meal delivery services. No other city has the vastness nor the complexity of the Mumbai system, delivering hundreds of thousands of lunches every day from individual homes to places of work. It is truly amazing and fascinating to watch even just a small part of the process. Collecting lunches for his delivery area. 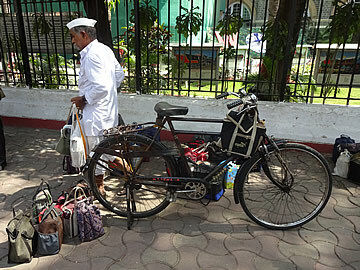 The white clothing is traditional for the dabbawalas. Marie Percot2 describes the delivery system very well: each dabbawala walks from home to home collecting lunches and placing them in a wooden box which he carries on his head. 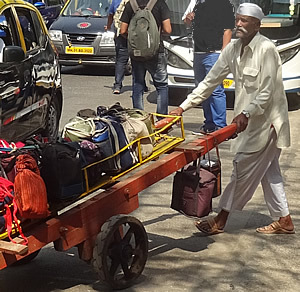 When he has collected his quota he takes it to the nearest railway station where dabbawalas meet and divide the lunches into groups for destinations down the line. Bags and canisters are slung all around the bicycles. 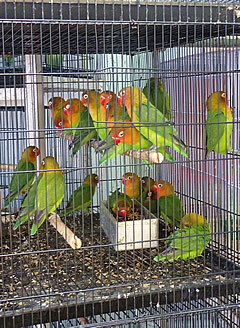 A cage is no place for a bird! One of the reasons that the system works in Mumbai and is impossible elsewhere is the structure of the rail network in the city. It is very simply two tracks running north to south, one terminating at Churchgate and the other at Victoria (Chhatrapati Shivaji Maharaj) in the city. Both lines go through Dadar station allowing a crossover. 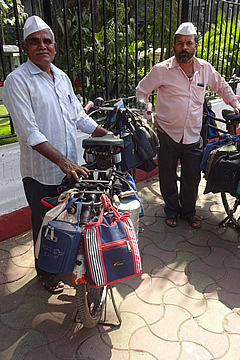 The lunches might pass through the hands of several dabbawalas, each passing lunches to another dabbawala who can take it a step closer to its ultimate destination. 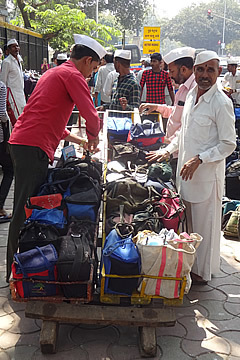 A dabbawala may start at the northern end of the Churchgate line, for instance, but delivers ultimately to a specific area near the Victoria terminus; he will have to pass on those dabbas destined for the Churchgate area to dabbawalas going there, and other dabbas not destined for his specific area to others. 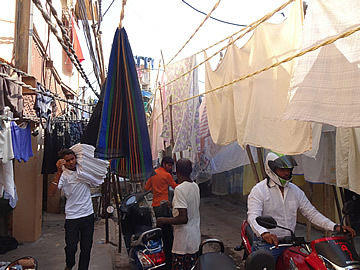 Each in turn may not be going to the exact area for final delivery and have to pass on the dabbas to someone else, until ultimately they are given to the dabbawala delivering to the correct area. After lunch the whole system is repeated in reverse! 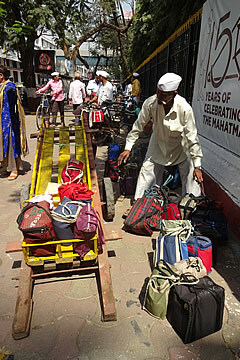 We went to Churchgate to watch the dabbawalas distributing the lunches into groups to be delivered to their final destinations. Hand carts and bicycles are both used - some of the bicycles looked very unstable with huge numbers of bags and canisters slung around them. It looked a little chaotic but obviously is well-organised because the system works! A number often quoted is that only one mistake is made in every six million deliveries - a six sigma operation! 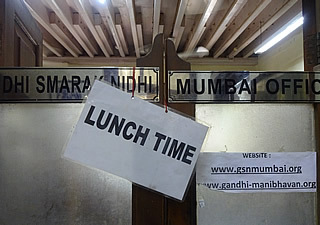 Before our own lunch we made visits to Crawford Market and Mani Bhavan, the place where Ghandi stayed when in Mumbai. 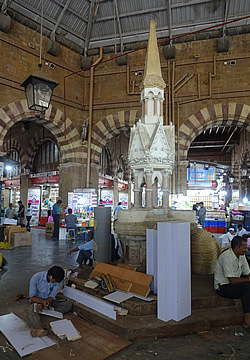 The current Crawford Market building is 150 years old. Rudyard Kipling's father, John Lockwood Kipling, designed carved reliefs on the exterior of the building - Rudyard Kipling was born in Bombay. 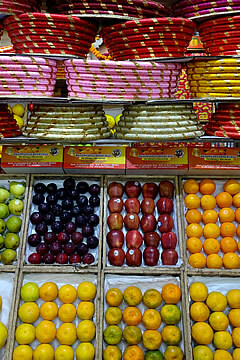 The colourful baskets are for gifts of fruit. 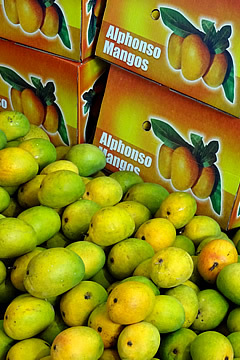 The market is both wholesale and retail and is quite large with many different areas devoted mainly to fruit and vegetables, but also animals and birds, household items, spices and sweets, among many other things. 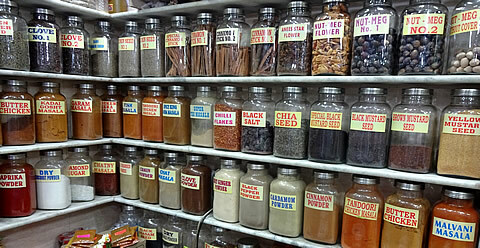 The Spice King shop has a vast array of spices, curry and massala mixes, herbs and teas - we bought some green curry to bring home. 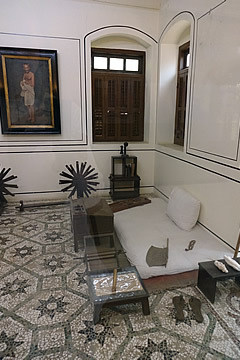 Mahatma Ghandi's room in Mani Bhavan. Mani Bhavan is the house where Ghandi stayed when in Bombay, now converted into a museum and library for research, and something of a shrine to the man who advocated non-violent protest and civil disobedience to gain independence for India. Wonderful lunch at Captain Cook's. 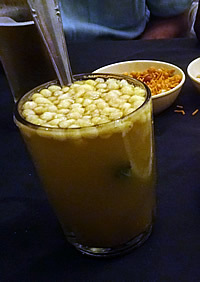 Neither of us enjoyed this traditional drink with chickpeas floating on top, opting for a beer instead. Time for lunch, and what a lunch it was! 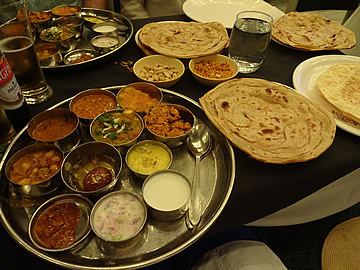 Our guide took us to Captain Cook's and chose a vast array of superb curries, a chutney, two sweet dishes, one a lovely cardamom custard, plus papadums, paratha and rice. It was far too much for us and our guide had the restaurant package a remaining paratha and a lot of rice which our driver later gave to one of the street people, which we thought was really great. 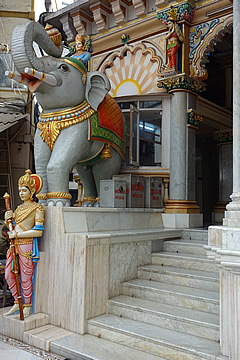 A small temple near the papadum makers area. 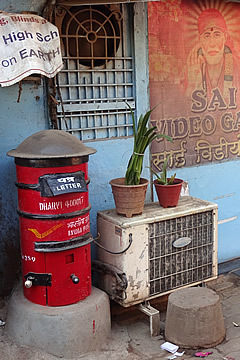 A letter box. We were assured the postal system works well. 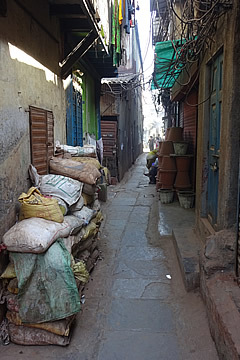 We emphatically did not want to visit a slum, it seemed very voyeuristic to go into slums to see poor people's homes. However, we were persuaded that this guided visit was more about the industries than staring at people, though it did turn out that we visited a home and were made very welcome. Onions and a lot of coconuts. Some still go barefoot in Dharavi. 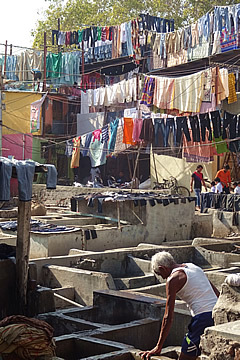 Dharavi is vast, home to over a million people, and sprawls in the centre of the city. 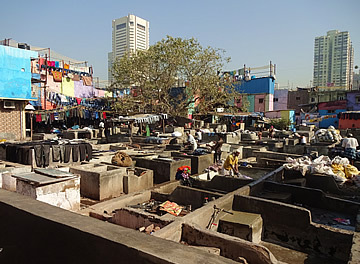 It was the slum featured in Slumdog Millionaire. The workshops and dwellings are crammed together, threaded by narrow alleys, and are a hive of industry. Metalwork, pottery, recycling, leatherwork, needlecrafts, and many more kinds of work support the inhabitants. 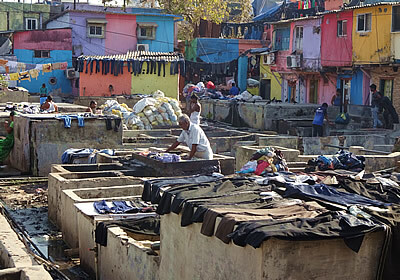 There is obviously poverty here too, and some very unhygienic conditions, but it is an incredibly industrious place. Our first stop was to the ladies making papadums, photography was not allowed here. They slap the dough onto a metal plate, roll it out, trim and throw onto upturned hemispherical baskets to dry. They work very fast and make hundreds in a day. 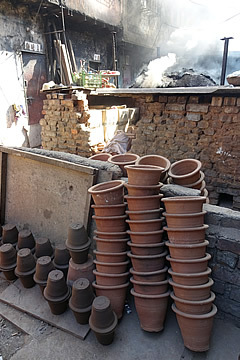 The pottery area is extensive with families involved in the business of creating all manner of pots. 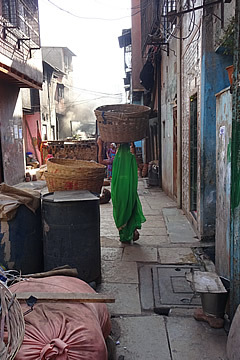 A woman carries a huge basket of pots to be fired in the smoking ovens beyond. 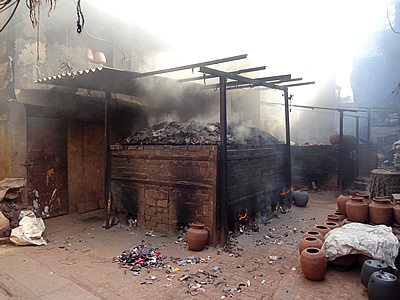 Where the kilns are working is like a vision of hell. The smoke and heat are almost overpowering. 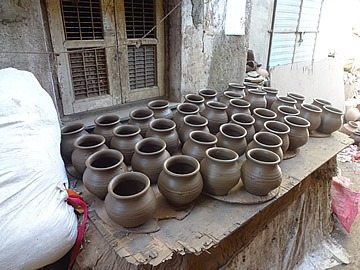 Our guide knows one of the potter families of Dharavi and we were welcomed into their workshops and home. 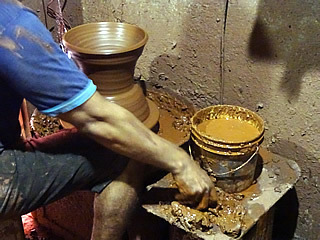 They were making large-bellied pots with a wide rim, ingeniously fashioned separately in a bowl-shaped stone vessel, and then pressed onto the top edge of the pot belly. 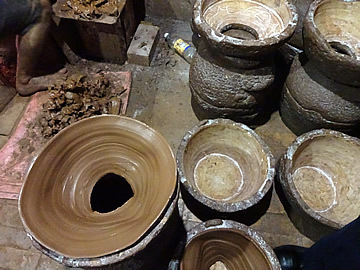 The whole family was involved in the process from making the pot, forming the rim, to decoration and firing. 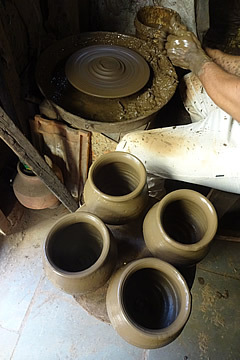 Forming the rim of the pot. Note the embossed decoration on the interior of the top bowl which is transferred to the rim. The ten year old daughter of the family showed us around their home which was very dark, long and thin with an open door at each end to allow a cooling breeze. 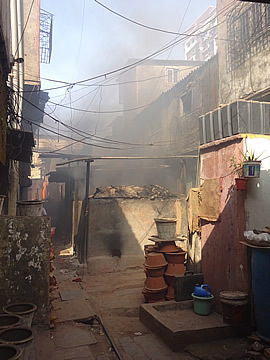 Two or three aunties and an uncle were also there, one auntie on the ground floor finishing off pots, one auntie on the first floor - up a steep ladder-like set of metal steps - cooking on a two burner hot plate, and the uncle on the second floor. The upper floors were spotless, a flat screen tv in quite a few of the rooms. Everyone was very genial and friendly, the little girl showing us the two family shrines with a bewildering number of gods, many of whom I'd never heard. They talked about their family, two live in the UK, others work on ships and we sat and chatted for a while. 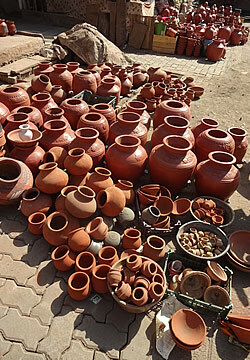 All kinds of pots for sale. We went on to an extensive recycling area, with different sections for different materials. It seems they recycle almost anything: metal, wood, paper, cardboard, plastic, electrical items, computer equipment, furniture. Everything is sorted and prepared for recycling - plastic is chopped into tiny bits, cardboard flattened and bundled together. This must be a relatively recent development but it is already employing many people. 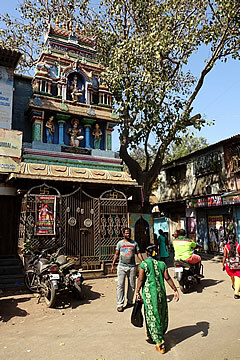 Temple or shrine near the tanners' and embroiderers' areas. 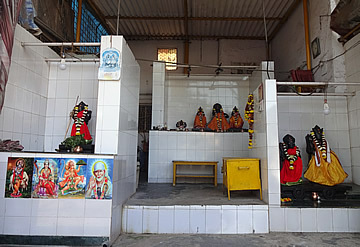 The black statues are adorned with colourful robes and garlands. 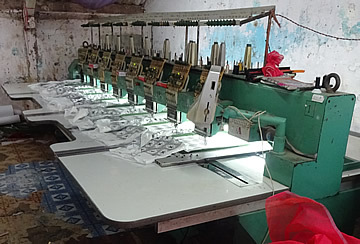 This machine can embroider eight pieces at a time. Sanitation can be very poor. 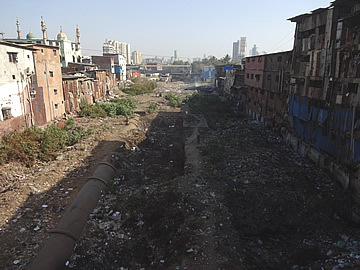 In some areas waste, including from toilets, is dumped straight into waterways. We drove past a wide gully where storm water flows and stopped on a bridge. The houses are crammed together with no space between, some having box toilets suspended over the gully which disgorge directly into the water - a most disgusting waterway, full of rubbish and heaven knows what else. The machine embroiderers are all men. Leather stamped with a reptile pattern. The final two work areas we visited were the embroiderers and leather workers, next door to each other. The embroidery is all done by machine, either by individual men or on a computerised system. The men were making panels for women's clothing and the results are impressive. 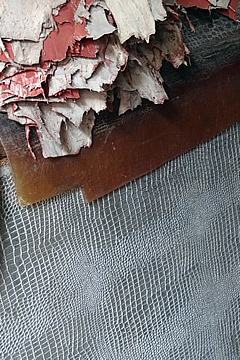 Animal skins waiting to be worked on. 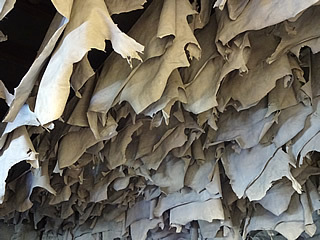 The leather workers were taking animal hides and finishing them off, flattening them in a rolling machine, stamping patterns onto the surface for instance. 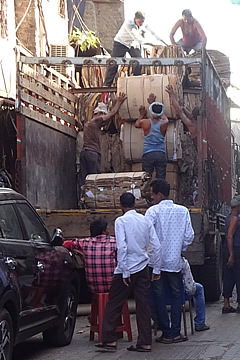 It was really fascinating to see the wide range of industries in Dharavi, and how hard the people work. Mostly they ignored us, and we didn't see any other tourists looking around. No doubt if the tours become more popular attitudes will change, but for now, two tourists and a guide don't make a significant impact!